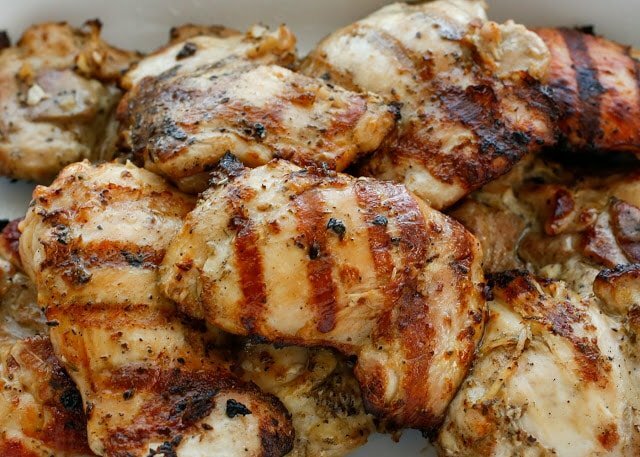 Juicy, incredibly flavorful grilled chicken is easier than you might think; especially when it starts with a marinade loaded with flavor from beer, garlic, and a sprinkling of herbs. This simple Beer and Garlic Chicken Marinade has become a staple in our house over the past few years. The chicken turns out absolutely perfect; tender and juicy every time. I used beer in a marinade for the first time when I made the Smoky Chicken and Bacon Burgers almost five years ago. (And yes, those burgers are every single bit as amazing as they sound!) 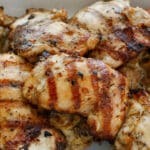 We loved the flavors so much I immediately started playing with a larger batch marinade recipe for grilled chicken. 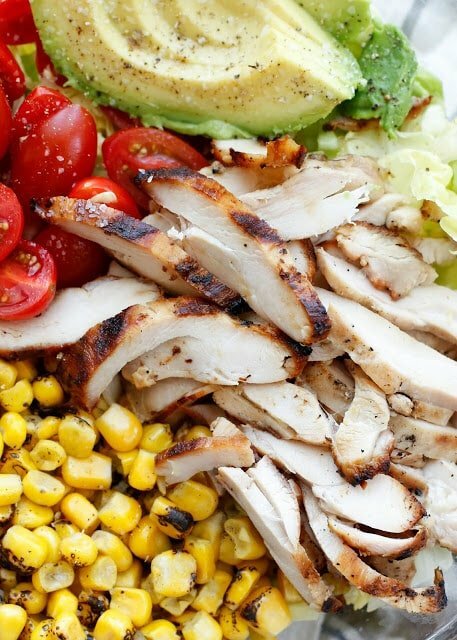 We like to grill a good bit of extra chicken each time we are grilling and then keep it in the fridge for easy lunches, like the salad pictured here. I frequently double this marinade and will grill a huge batch of chicken all at once. We’ll quite happily eat it all week by itself, over salads, and in sandwiches and wraps. Place the chicken in a gallon size zip-close bag or an airtight container. Stir together the marinade ingredients and pour over the chicken. Seal and turn the bag or container to coat the pieces evenly. Let rest in the refrigerator for 12-36 hours. I try to marinate chicken for a minimum of 24 hours most of the time, because the longer time makes a huge different in the flavor. When ready to cook the meat, let the chicken rest on the counter for 30 minutes to an hour prior to cooking. Preheat the grill to medium heat. 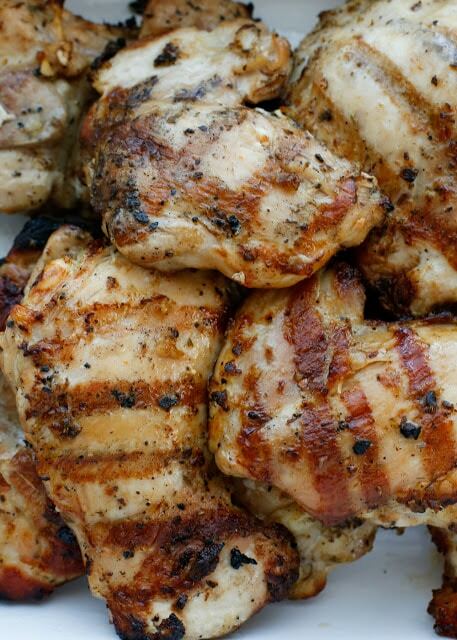 For boneless skinless chicken thighs, cook the meat 6 minutes on each side. Then increase the heat closer to medium-high and cook an additional 4 minutes, as needed. Enjoy! flavors throughout the meat. Once thawed, cook as described above. Would like to get recipe in email! Is there a missing ingredient? Above the oregano it says "1 1/2 tablespoons" - but nothing after it (at least on my screen). I'd like to put the marinade together now so I was just wondering! Thanks! It should say: 5 large cloves of garlic, minced, approximately 1 1/2 tablespoons. Meaning, approximately 1 1/2 tablespoons of minced garlic. I hope that helps! This sounds amazing, but just wondering if you could use a roasting dish and bake this in the oven as well? You can certainly bake this chicken and it will be delicious. Grilling is simply my personal preference. This looks delicious. Do you use toasted sesame oil, or regular sesame oil? Thanks for the great recipe! This will work with either one. Can you use a light beer like Michelob Ultra or Miller? That is what we have on hand. This chicken will work with any beer, Peggy. Enjoy!